Ridley Scott's 1979 film Alien is on my very short list of all-time greatest and most favorite movies. I first got to watch it in 1984 and even today, after countless numbers of times of watching it, it has never failed to thrill and enthrall. 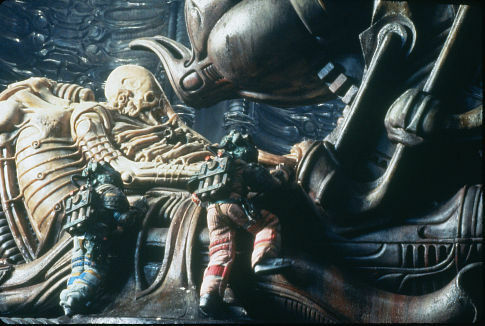 Alien is the perfect science-fiction and horror film. Its 1986 sequel Aliens is one of the darn few movies widely regarded as being just as good, if not better even, than the original. But that was mostly an action movie: Scott's Alien was nearly pure unbridled terror of the classic form. Unfortunately what happened to the Alien franchise after that hasn't been anywhere as up to par with what Ridley Scott and James Cameron did. Alien 3 and Alien: Resurrection well, let's put it this way: they both had their moments, but I don't regard them as being true "Alien"-ish canon. Maybe they're just bad dreams that Ripley is having and she's still aboard the Sulaco along with Hicks, Newt and Bishop on the way back from LV-426. Even Alien vs. Predator was better than those entries (and I haven't seen that movie's sequel so I can't comment on how good or bad it might be). Anyway, when word came that Ridley Scott was planning on returning to the series that he helped to create, I was ecstatic. I had been hoping that he could get things back on track. Maybe even do something drastic to make us forget that Alien 3 and Alien: Resurrection never happened to begin with. Unfortunately, it looks as if that is not to be. We've known for some time already that Scott was going to do a "prequel" to the original Alien... which I already thought was a way wrong approach. Now it's worse. Confirming some rumors that have been making the rounds for awhile, Scott spoke to MTV Movies and revealed some details about the Alien prequel. Including what it's going to mostly be about. Yup, the Space Jockey. That fossilized ancient extraterrestrial pilot that Dallas, Kaine and Lambert found in the derelict spaceship on LV-426. Scott told MTV that "It's fundamentally about going out to find out 'Who the hell was that Space Jockey?' The guy who was sitting in the chair in the alien vehicle — there was a giant fellow sitting in a seat on what looked to be either a piece of technology or an astronomer's chair. Remember that?" How could we forget a thing like that? But I for one am compelled to ask: Do we want to know everything about what the Space Jockey is? That was one of the things that most made Alien succeed as a horror story: the Lovecraftian atmosphere of the film. Here are seven blue-collar working stiffs aboard a glorified tugboat. You know: people that on some level we can all relate to. And they're earning their paycheck in the depths of interstellar space: the most unknown and inhospitable setting known to man. And they come across something that they not only don't understand, but the crazy geometry of it practically screams out "you can't understand this". Honestly, I don't want to understand that. And I've no doubt many others feel the same way. The Space Jockey - whatever the heck he/she/it is - is part of a mystique that would forever be gone if we knew any more about its back story. It is simply... what it is. Nothing more and nothing less. But this is definitely a case of "less is more". There is plenty of potential in the Alien franchise that hasn't been touched upon at all. 'Twould be something that fans would much more appreciate if Ridley Scott took the road less traveled than that of a prequel. Seriously, I want him to return to the series... but not like this. Leaving things unexplained is a lost art in movies these days. I saw a remake of the movie "The Fog" the other day, and was amazed how they felt a need to explain what everything is. So, in short, I totally agree with you on this.